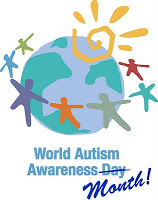 Happy World Autism Awareness (and Acceptance) Day!! We have exciting news that we can't announce for another week, so here are a couple of updates about people we love! Violet, Vijay, and Charlie were featured in a wonderful article about acceptance on the site Eco Child's Play. And, Paula Durbin-Westby has been busy at autism NOW, an amazing resource for individuals on the autism spectrum and their families.